I'm a sucker for anything that contains custard and pastry, and in you add caramel to the combo I'm pretty much in heaven. So, it's no secret that I love profiteroles. That being said, I don't make them quite as much as I would like. There's a good reason for this and it's not because they're complicated, it's because when I do make them I can't resist eating them. All of them. In a very short period of time. For this reason, I only make them for friends. Sure, I still devour the delicious morsels but instead of eating the whole batch I only get 2 or 3. Sure, I'd like to eat them all but there aren't enough hours in the day to work off all those eggs or enough toothpaste to brush away all that delicious caramel. Essentially what I'm saying is there's nothing good in a profiterole but it's okay because they're delicious. These ones are especially delicious as they have a subtle orange flavour. 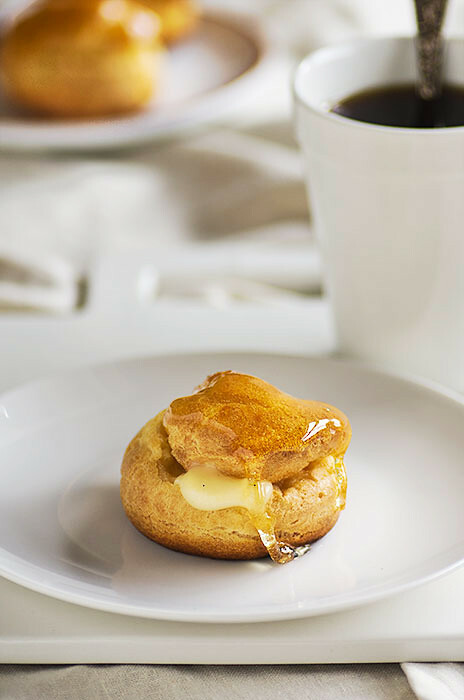 Essentially they're just a variation of these ones with a slightly better pastry cream recipe. And yes, my bottoms got a little brown - hopefully yours won't do the same! Combine the milk and orange zest in a medium saucepan and heat until the mixture just begins to simmer. Remove from the heat and let it steep for at least 30 minutes. Strain the milk and zest mixture and return to a clean saucepan. Heat the milk just below boiling point and remove from the heat. Heat the mixture, whisking constantly to prevent lumping, until it reaches the boil. Continue cooking for a about a minute or until the pastry cream is very thick. Remove from the heat and whisk in the butter. Stain the mixture into a clean bowl. Preheat the oven to 220°C (430°F), line a large tray with baking paper. Combine butter, salt, water, and sugar in a large sauce pan and bring to the boil over high heat. Add the flour and stir continuously with a wooden spoon until the mixture comes together in the centre of the pan. Remove from the heat and stand for 5 minutes. Add the eggs, one at a time, beating with the wooden spoon after each addition. The mixture will become matte when the egg is fully incorporated. Spoon mixture into a piping bag fitted with a large 1cm (1/2 inch) nozzle. Pipe 5cm-diameter mounds about 4cm high on the paper-lined oven tray. Bake for 15 minutes and then reduce heat to 180°C (350°F) for another five minutes. Remove from oven and carefully transfer to a wire rack. Cool to room temperature. Combine the sugar, lemon juice, and water in a small saucepan and stir over medium heat until the sugar has dissolved. Increase heat and bring to the boil, cook for 5-6 minutes or until the mixture in a caramel colour. Remove from heat. Before cooking the caramel, fill a piping bag fitted with a 0.5cm (1/4 inch) plain nozzle with pastry cream. Insert the nozzle into a profiterole and squeeze the bag to fill. Set aside on a plate or wire rack. 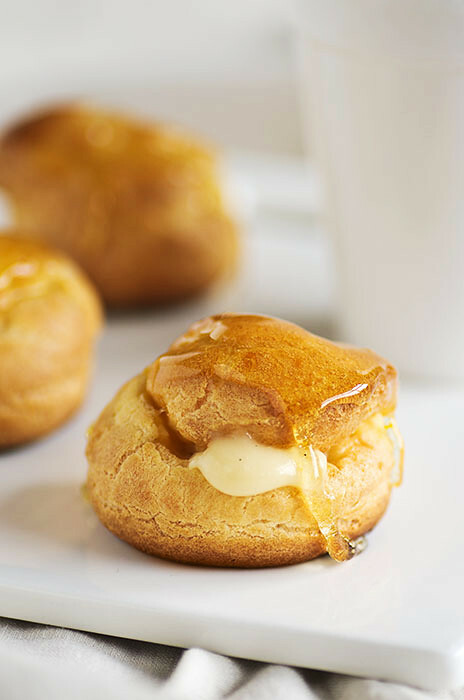 Cook the caramel, careful dip the tops of the profiteroles in it and arrange the finished profiteroles on a plate. Serve fresh. I've never had a profiterole but you make it sounds quite delicious. The combination of orange and caramel is intriguing too. I love how you said there's nothing good in them but it's okay; sometimes you just have to enjoy food because it's that tasty! these sound like heaven, and the orange is perfect for summer!